Magaluf airport, More than the bad reputation this place has gained lately, Magaluf is a city full of great potential, a lot of fun, and a very diverse hosting offer. Known for its cheerful nightlife and huge brash, Magaluf is located on the Southwest of Mallorca, Calviá council, close to Palma Nova. This location was the favorite and practically the only one destination for the British tourists during the 60s, and now is considered by the same group of people as the “Capital of Party” on the island. Transfers from Palma Airport to Magaluf, During the last years, Magaluf has enjoyed a considerable local capital investment. The government y Spaniard authorities were worried for the that already mentioned bad reputation, and how that issue was tarnishing the whole island, they have decided to invest to, for example, tearing down cheap skyscrapers and forced the investors to respect building regulations The establishment of behavior rules for tourists that goes along with the idea of party during the whole day. Airport to Magaluf, Despite its reputation, Magaluf is a very well supervised zone and it counts with a great quantity of attractions for families who enjoy the beaches with the view to the Illa de Sa Porrasa, the majority of attractions are located near the sea, food to go stands and stores. There is a wide variety of services and facilities for the residents and visitors. To make your Magaluf transfers, you can take a flight from your destination. The nearest airport around the zone is The Palma de Mallorca International Airport. This airport is 20 minutes away from Magaluf and from the same terminal, you can take one of those transportation services previously hired before arriving. 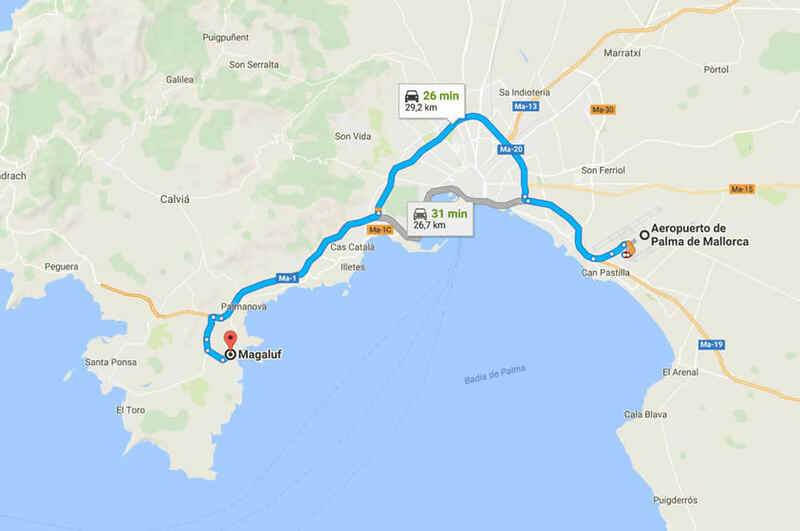 The transfers from Palma to Magaluf is quite near, that is why you won’t have any inconvenience to get there easily. Magaluf Airport transfers, the best option for your transfer is to contract with us we offer private and exclusive services by bus, taxi and minibus of different capacities we have a wide offer from the airport, and you can also take a taxi (if your budget allows you to do so), but varies depending on the time of your arrival. You can rent a shuttle service, which is by far the cheapest option to get there. You can hire this very safe and comfortable van, which takes you from the airport to the place you will be staying there. 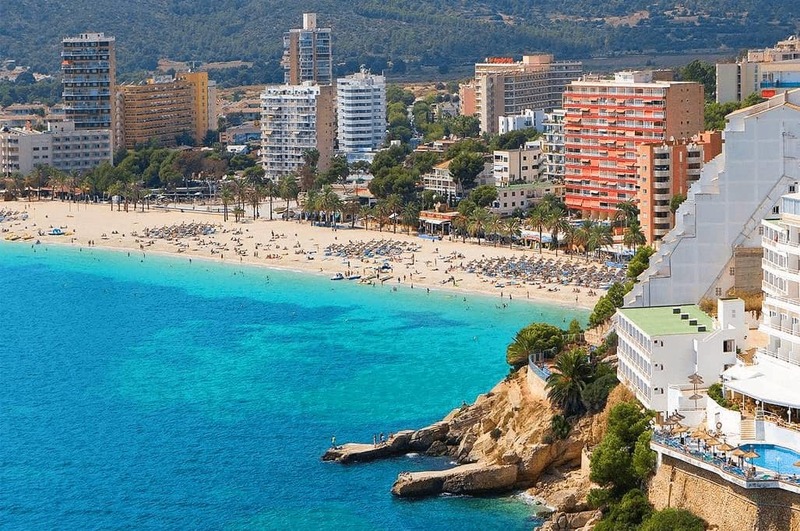 Transfer from Palma to Magaluf, Magaluf hosts some of the most popular and established tourist attractions from Mallorca, including Pirates (located in a theater built specially for the show), the House of Katmandu, Karting Magaluf, Aqualand and Water Park. You can also find the Mallorca Rocks Hotel. This place offers music concerts, as well as different artists and well-known DJ’s live during summer. Many of them have had a tremendous succeed on the main UK charts. In 2012, the beach zone of Calviá reborn thanks to the introduction of the exclusive Nikki Beach and Wave House that have given a new refreshment to the zone. Magaluf is a place oriented to tourism. Everything there is thoroughly thought to please the visitors from all over the world who are looking for a stunning vacation near the sea with a big sangria jar on your side, and your cup ready to be filled on the other side. This place offers many things to do that you don’t really want to sleep or wish the day would have more hours to enjoy them all. Apart from party and going to the beach, you can also enjoy all kinds of water sports, live entertainment and theme amusement park. If you are young (or you feel young), we recommend go to BCM, one of the most famous discos in Europe. If you travel with the family, you can enjoy Pirates show, as well as the different aquatic parks. Magaluf is a complete a touristic, totally equipped to host tourists on a high scale. It has a lot of hosting offer, from luxurious hotels, passing through 3-star hotels, up to apartments, camping sites and hostels. Depending on how much time you will stay in Magaluf, your personal likes, and above all, your budget. We highly recommend you to search one option or another to sleep in Magaluf and spend some days there. If you plan to stay for a few days, you may be interested in a cheap hotel, due to the lack of time you will stay there. However, if you plan to stay longer, for example, 15 day or maybe more, I will recommend you look for apartments with a good offering, that for sure, at the end, you will get better price and save money for food to cook inside the apartment. For all those reason, Magaluf is an excellent choice for you to have a great time at Summer.